The Abstract Art movement took place in the United States. In its purest form, Abstract Art has no subject. It is just lines, shapes, and colors. The Abstract Art movement is called Abstract Expressionism because, although the art has no subject, it is still trying to convey some kind of emotion. The Abstract Expressionism movement began in the 1940s in New York City after World War II. However, the first real Abstract Art was painted earlier by some Expressionists, especially Kandinsky in the early 1900s. What are the characteristics of Abstract Art? The main characteristic of abstract art is that it has no recognizable subject. Some Abstract Artists had theories on the emotions that were caused by certain colors and shapes. They planned out their seemingly random paintings to the last detail. Other Abstract Artists painted with emotion and randomness hoping to capture their emotion and subconscious thoughts on the canvas. 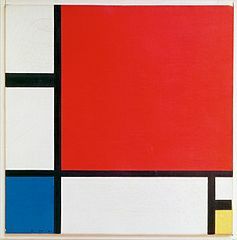 Mondrian painted with precision and geometric shapes. In this painting he creates a sense of balance using straight black lines, white spaces, and primary colors. He painted many other pictures using the same style. Mark Rothko painted a number of paintings that were basically large blocks of color. Like this painting, there was usually a border and the edges of the blocks blurred together. Rothko didn't say what the painting was supposed to mean. He left interpretations up to the viewer. As simple as this painting may look here, it sold for over $72 million in 2007. See this picture here. Jackson Pollock created his own unique style of painting. He would splash and dribble paint onto the canvas straight from the can. This style of art was later called Action Painting. In this painting yellow and brown paint is drizzled to create an interesting nest of colors and textures. The painting sold in 2006 for an amazing $140 million. See this picture here. Willem de Kooning - Kooning was a Dutch artist who became a part of the New York City Abstract Expressionist movement. His most famous painting is Woman III which sold for over $137 million. Franz Kline - Kline was an American painter mostly known for his black and white paintings. He was considered an Action Painter. Wassily Kandinsky - Kandinsky is considered the father of abstract painting. In an effort to capture sound and emotion in art, he painted some of the first major abstract works. Piet Mondrian - Mondrian developed an Abstract painting style that involved straight lines and colored rectangles. He called this type of painting "The Style". Jackson Pollock - Pollock created his paintings without using brush strokes in what would later be called Action Painting. He became famous for his large paintings made with dribbles and splashes of paint. Mark Rothko - Rothko's paintings are known for their large vibrant blocks of color. Before World War II, Paris had been the center for most new modern art trends. After World War II, New York City emerged as a major center for artists. A movement similar to Abstract Art was launched in the early 1900s in Italy called Futurism. One of Futurism's major artists was Giacomo Balla. One of the most extreme styles of Abstract Art was called Suprematism. Russian Artist Kasimir Malevich painted in this style. One of his paintings was a white square painted on to a white background. Famous Abstract artist William de Kooning arrived in America as a stowaway on a boat. He worked as a house painter for a while.